Since March 2007, my main focus has been to speak and believe in my healing of this miserable, draining and mysterious condition, Dystonia. Many of my friends, fellow musician/artists and family still understand very little of what I go through on a daily basis and their expectations of me add to my stress load. Getting through my boardwalk Gospel concert with my band this past Saturday was a great challenge. Between rehearsals, organizing the set list and preparing, my spasms were very violent and draining. Though my band mates sounding wonderful, I couldn’t enjoy anything due to the intense movements of my mouth and throat muscles. I couldn’t wait to get home and drop into bed. The next morning, after yet another night of poor sleep, I dragged myself out of bed in a zombie-like state, praying for God to get me through my worship leading at Pastor Sandra’s church service. As I put my guitar in its stand and took my seat, I already felt the spasmodic movements increase. I had to rest my head forward on the back of the seat to get some relief and so everyone would see my facial grimaces. My throat muscles throbbed and lower mouth and jaw opened every second. My eyes were squeezing shut and opening. In 15 minutes all my make-up came off from the constant tearing. I was getting more and more miserable by the minutes and could barely focus on Pastor Sandra’s Message. I could only imagine what the other people though of me. A day in the life of DYSTONIA. Afterwords, I had a full afternoon and evening of cramming two sets of parents visits into 4 hours. After service, I collapsed exhausted onto the back floor area of our car. After today’s holiday, I will jump back into the tedious race of finding the proper practitioner who can address this disorder. Of the 3 primary care physicians, six neurologists, eight chiropractors, several acupuncturists, and one myofacilaist, only one has come close in giving me the most accurate diagnosis, Natalia, in Toms River New Jersey. My husband Mark’s suspicion about high metals were confirmed by my two hair analysis, but none of the doctors wanted to address his concerns or even suggest a treatment that his insurance would cover. Thus over four years of suffering and greatly diminished life quality. 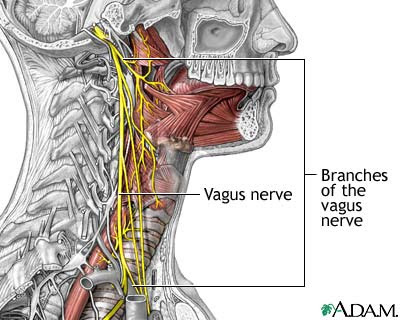 I am confident that Natalia has pinpointed the Vagus nerve condition. I’m sure that even many DYSTONIA sufferers may have a maladjustment of their upper vertebrae and if the pinched area of the nerve is reset, we can move on to healing! I hope that Dystonia sufferers will look into the injured Vagus nerve as a possible cause of their spasms as well as being open to alternative means of treatment. Natalia said some devices she used were not even accepted in these United States. Of course not, the drug companies will lose out on their kick-backs and business. They want us to be totally dependent of drugs that does not even treat the root cause of the condition. And, patients are settling for band-aids that are costly and further damaging to their bodies and minds. People, you need to wake up. Are you willing to further damage your body without taking the time to do the research and use wisdom. God created your body to heal itself. Think about it! Seek a great and caring natural practitioner. Here is the area I suffer from: throat, neck, oro-mandibular jaw jount and ears.